FanGraphs uses Slack in order to keep all the writers in communication, and it’s in there that we claim post topics so that we don’t accidentally overlap. A couple days ago, I made a soft commitment to write about Aaron Sanchez’s secondary stuff, regardless of how he actually did on Tuesday. The way I figured, one way or the other, it was going to be worth an article. Now, what I didn’t know was that the Rays/Blue Jays game would end with a very 2016 type of controversial call. That’s overshadowed everything else, and few care anymore about how Sanchez did in the earlier innings. But I’m here to fulfill my commitment. And, guess what: I’ve long been a Sanchez skeptic, as his being a starter is concerned, but he had a wonderful, wonderful outing, before the Jose Bautista slide. He made it very easy to be encouraged. Let’s start simple and go from there. Sanchez lasted seven innings, allowing a run on five hits. He didn’t walk anyone, he didn’t hit anyone, and he recorded eight strikeouts. That’s an excellent line. You can forgive the one solo dinger. Going to the next step, Sanchez picked up strikes on 64 of his 91 pitches. That works out to a rate of 70%. Last year, in his 11 big-league starts, Sanchez never finished with a strike rate over 64%. His overall average was a lousy 58%. It had also been around that low in Double-A and Triple-A. The game line implies that Sanchez was in control. A more granular examination supports it. Sanchez’s release point? He basically maintained it, over seven innings. And the velocity? According to Brooks Baseball, Sanchez’s average fastball velocity in each inning started with a 96. So he didn’t show signs of wearing down, after coming out too strong. He started with heat, and he finished with heat. Look how well the pitches are (mostly) grouped. There’s one slider there in the middle, and then one weird “fast curveball” or something, but on this plot it’s easy to identify the fastballs, the changeups, and the curves. Each of them stand out, and beyond that, there’s not a lot of variation in the spin axes. It’s suggested that the pitches were thrown with pretty good consistency, or if you prefer, repeatability. I take this as a sign that Sanchez did a good job of repeating his deliveries, which might be the very most important part of pitching. It’s plain to see that fewer of these pitches were left up. Presumably, that’s a consequence of better repetition. 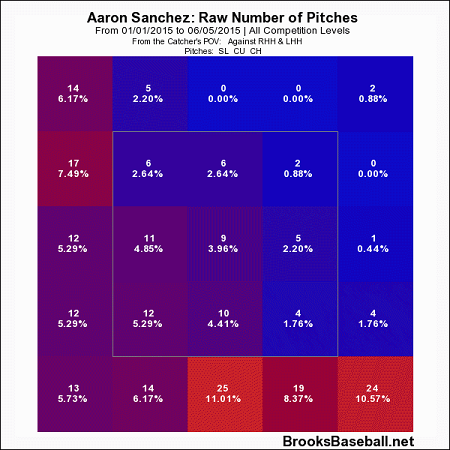 A year ago, Sanchez threw 60% of these pitches in the lowest two-fifths of the plot shown. Yesterday, that’s where he put 21 of these 28 pitches. He didn’t fly open so much and miss up and arm-side. There was better control of the secondary stuff, therefore. 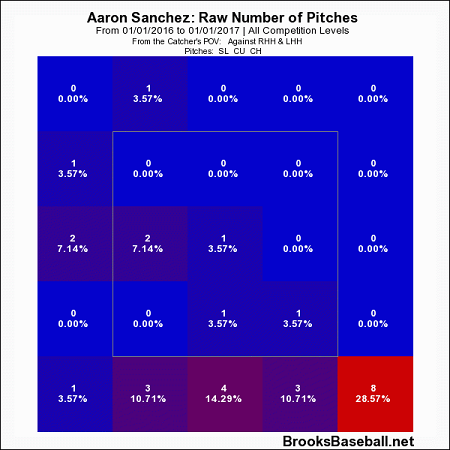 And at the same time, Sanchez went from 43% fastballs in the zone to 56%. This can be easily simplified: Sanchez threw strikes with his heater, and that allowed him to throw non-strikes with his offspeed stuff. The result: Sanchez got strikes in the zone, and he got strikes out of the zone. He didn’t get strikes out of the zone before. 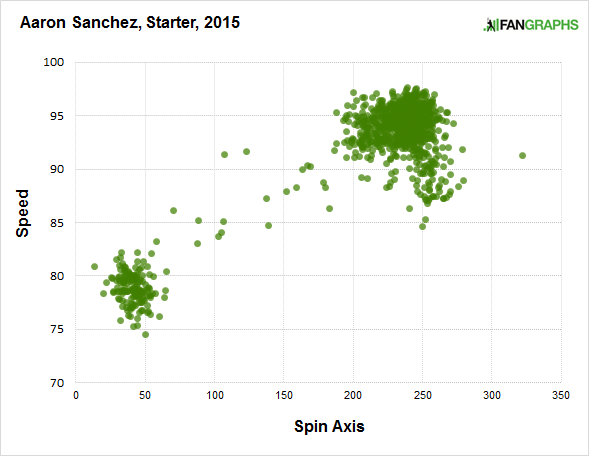 As a starter last year, Sanchez ran an O-Swing rate of 22%, and he topped out at 30%. Yesterday he finished at 41%, with 19 Rays swings at 46 would-be balls. When a pitcher can get strikes without throwing strikes, there’s no truer sign of being in command. Tuesday, in his first start of 2016, Aaron Sanchez was legitimately in command. It builds on what seemed awful promising in spring training, and this is something that would’ve been difficult to imagine saying last summer. But it happened, over 91 pitches against a pretty good team, and even though most people just remember the game for its conclusion, what Sanchez showed could mean more to the Blue Jays than one unfortunate loss. It should go without saying that Sanchez needs to keep this up. Every wild pitcher has had un-wild days, and it’d be better to have five good starts than one. And Sanchez, for his part, did in fact miss with a few early curveballs. He needs to take these gains forward, in order to be a truly convincing starter. 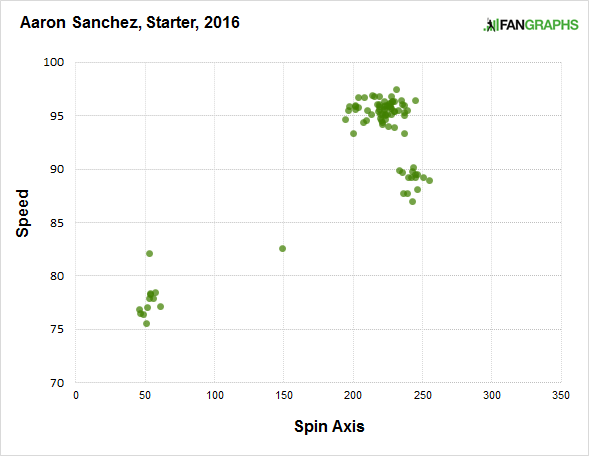 But already, Sanchez showed something he didn’t show much last year. Strikes have always been the question. Aaron Sanchez just threw strikes. We hoped you liked reading Aaron Sanchez Aced His Test by Jeff Sullivan! A positive article about Aaron Sanchez as a starter? That’s allowed on Fangraphs? Fangraphs praises players/teams when they have a reason to be praised, and criticizes players/teams when they have a reason to be criticized. Aaron Sanchez used to have a lot of reasons to be criticized, yesterday he had a lot of reasons to be praised. Fangraphs also praises players/teams when they have no good reason to be praised, and criticizes players/teams when they have no good reason to be criticized. I am not sure the snark you are responding to is warranted, however no matter how good FanGraphs are, they are not perfect. So… What you’re saying is… We need more Twins articles? No, no matter what, we don’t need more Twins articles.